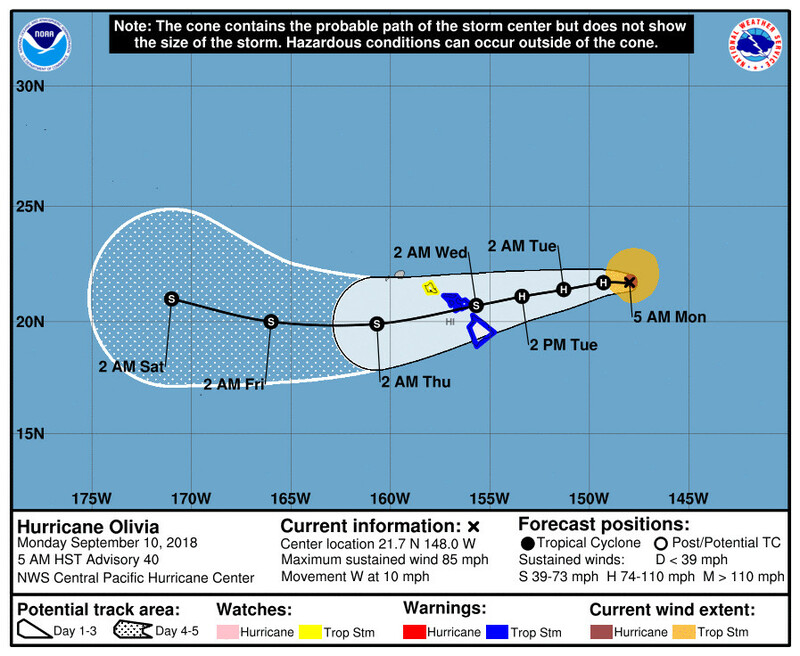 HAWAII ISLAND - Olivia has maintained its strength as a category one hurricane overnight, with maximum sustained winds near 85 mph with higher gusts. (BIVN) – A Tropical Storm Warning has been issued for Hawaii Island this morning, as well as Maui County, as Hurricane Olivia continues to approach the islands. A Tropical Storm Warning means that tropical storm conditions are expected somewhere within the warning area within 36 hours. Olivia maintained its strength as a category one hurricane overnight, with maximum sustained winds near 85 mph with higher gusts. Little change in strength is forecast today, according to the Central pacific Hurricane Center, with slight weakening starting tonight and continuing through Tuesday. Olivia is forecast to be a strong tropical storm when it reaches the Hawaiian Islands. Tropical storm conditions are expected over parts of Hawaii starting late Tuesday. WIND: Tropical storm conditions are expected somewhere within the warning area starting late Tuesday. Tropical storm conditions are possible within the watch area starting early Wednesday morning. RAINFALL: Olivia is expected to produce total rainfall accumulations of 10 to 15 inches. Isolated maximum amounts of 20 inches are possible, especially over windward sections of Maui County and the Big Island. This rainfall may produce life-threatening flash flooding. SURF: Large swells generated by Olivia will spread from east to west across the Hawaiian Islands early this week. This will cause surf to build along exposed east facing shorelines as Olivia approaches. This surf may become damaging across parts of the state. Olivia’s eye has been appearing at times this morning. The outflow pattern remains impressive, so it does not appear to be negatively impacted by vertical wind shear of around 10 kt. The satellite fix agencies (JTWC, SAB, and PHFO) provided unanimous subjective Dvorak current intensity estimates of 4.5/77 kt. The UW-CIMSS ADT estimate was 4.2/70 kt. Based on all of this information, we are maintaining the initial intensity at 75 kt for this advisory. 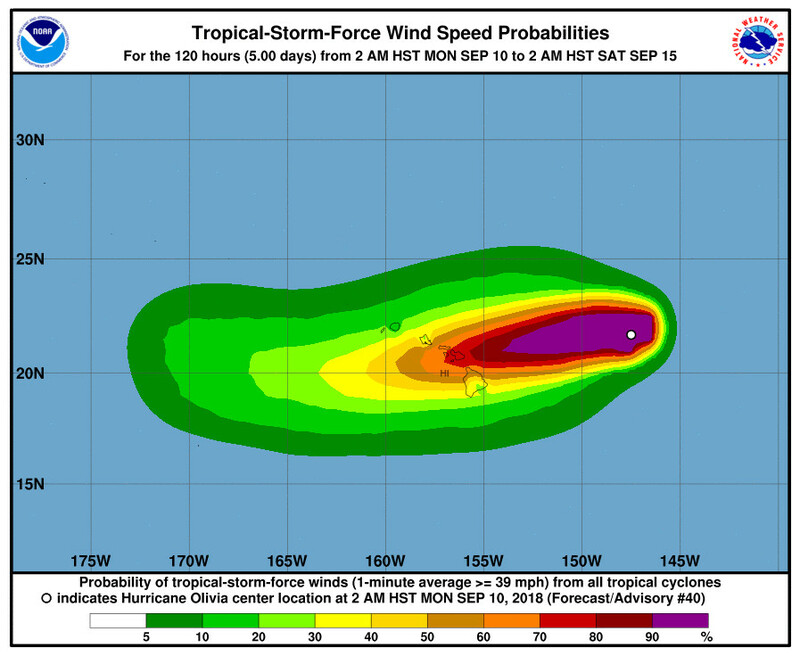 Note that an aircraft flown by the U.S. Air Force Reserves 53rd Weather Reconnaissance Squadron is scheduled to sample the inner core and outer wind field of Olivia starting in a few hours. This will give us a much better idea of the latest intensity of Olivia once they arrive. Olivia continues to move nearly due west with a current motion of 270/9 kt. This motion is being induced by a deep layer ridge to the north and northwest of the tropical cyclone. During the next 12 hours or so, the ridge is expected to strengthen and build southward ahead of Olivia, forcing the tropical cyclone to shift toward a west-southwest track. This motion is expected to continue through day 3. The track guidance appears have slightly more spread through 72 hours, especially from 36 to 72 hours. The spread is even greater during days 4 and 5. The current forecast track is very close to the previous, except it has been nudged to the right and is slightly slower during the first 72 hours. Little change has been made in the day 4 and 5 positions. This closely follows the latest TVCE, FSSE, GFEX and HCCA guidance. Again, since the is a wider spread in the track guidance, we want to emphasize the uncertainty in our track forecast. It is important to NOT focus on the exact forecast track of Olivia’s center across the islands. A slight deviation to the right or left can bring vastly different weather hazards to any islands that are directly impacted by this potentially damaging tropical cyclone. Vertical wind shear remains relatively weak in the vicinity of Olivia. Water temperatures, as well as ocean heat content values, are expected to increase along the forecast track. Therefore, Olivia will likely remain a hurricane through 36 hours. After that, increasing vertical wind shear is forecast to take its toll on Olivia, so that it may be a strong tropical storm within 48 hours. Additional slow weakening is expected to persist during days 3 through 5. The latest forecast is close to the IVCN and CTCI. Note that based on the latest track and intensity along with the wind speed probabilities, Tropical Storm Warnings have been issued for the Big Island of Hawaii and the islands of Maui County. 1. It is important to not focus on the exact forecast track and intensity when planning for Olivia. Persons on the main Hawaiian Islands east of Kauai should continue preparing for the likelihood of direct impacts from this system today and early Tuesday. Those impacts could include intense flooding rainfall, damaging winds, large and dangerous surf, and storm surge.